A dental implant restoration is considered to be one of the greatest innovations in modern dentistry. Dental implants are ideal for patients who are missing one or more teeth as a result of periodontal disease, injury, or even age. Missing teeth can cause you to feel self-conscious and reluctant to smile. Dental implants can restore your confidence. Dental implants can also be used to help hold dental bridges and even dentures securely in place, giving them a more natural look and feel. This can help improve your ability to both speak and chew properly. There are two main types of dental implants available today. The most commonly used type is the endosteal implant. 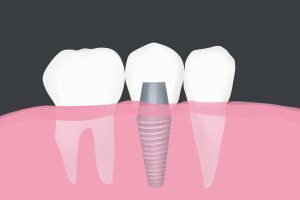 This implant consists of a metal post that your dentist or oral surgeon will surgically position into the jaw. Once the surrounding bone has healed, the replacement tooth or teeth will then be attached to the tooth. Subperiosteal implants are reserved for patients who have little bone structure remaining, and will be placed directly on the jaw. While dental implants are generally more expensive than other type of tooth replacements, there are several advantages that makes them well worth the cost. Dental implants can minimize the receding gums and bone loss that can occur with traditional dentures and bridgework, and implants don’t require the removal of healthy tooth structure from surrounding teeth like bridges do. Dental implants are also incredibly durable. When cared for properly, dental implants can last as long as 10-20 years. To find out if you may be a good candidate for dental implants, call Stonebridge Dental today at 972-547-0554 for a consultation. Our knowledgeable and helpful staff can answer any questions you might have, and will be able to determine if dental implants are right for you. We look forward to being able to help you achieve the best and brightest smile possible.